It's yet another week and I hope that this one will be a lot less stressful for everyone. I still feel weak as I write this. Weekend was unforgiving and I was bedridden the whole of Friday and Saturday with upset stomach and fever. It's a good thing that the hubby was very nurturing and despite his super manly ways, he managed to take care of me over the weekend. But I couldn't resist taking photos of some of my new stuff. One of those latest acquisition is the Charm Essentials Retractable Kabuki Brush! Every single time, Charm has a way of impressing me like no other. I'm happy that this brand of brushes have sated me for all my brush cravings. I've practically stopped hoarding other brushes. I even stopped lemming for MAC ones. That's how I seriously I'm crushing on these brushes. Really loving the all the new Charm brushes all boxed up in cute pink packaging with fonts TDF! So yeah, I'm a sucker for anything that is gold and I do love anything that glisten like sun! I really don't understand why many women are wary of such color. It's the most luxurious shade ever! And though my former Hot Pink Charm Retractable Kabuki Brush came with me where ever, it will certainly take a backseat because its Gold version is much more up my alley. Doesn't it look a fancier? And it resembles more of a kabuki brush, worthy of all mineral makeup lovers. I especially like how it gives me the right amount of coverage whether I'm using it with my The Body Shop All In One Face Base or my Ellana Intensive Mineral Foundation. 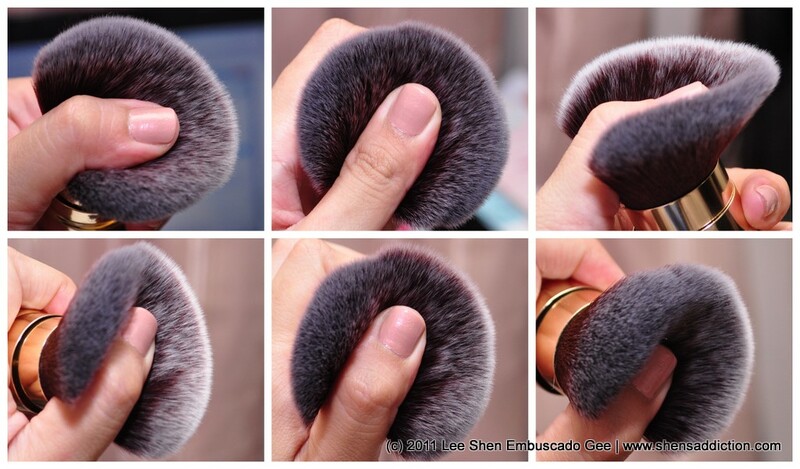 And when I manipulate the brush by pressing my thumb against the bristles, I can use this as serviceable blush and contour brush as well. How great is that right? Multi-tasker, indeed. And the side view isn't so bad either? Just look at how photogenic this brush is.. and let me tell you, that it's looks sleeker and chic-er in person. What's great is that it retains its shape even after I washing and drying it. Even when it takes a bit of time in drying, it's definitely worth it. What I do is wash it with a my reliable Dr. Bronner's Castile Liquid soap and let it fan dry, hanging downward, overnight. Most often than not, I can use it already in the morning. Do not by all means cap it when it is still wet to avoid molds forming and contamination. Please wait for it to fully dry. It's obvious that I'm gushing way too much over the new Charm Retractable Kabuki Brush. It's because I have every reason to! It's my dream brush. It's super soft and will remain so... forever. Beauty and Geeks, Eton Life Building 1, Ortigas. Did I say I love the box it comes with the brush? It gives you an insight of what this brush can do and best of all, on the side, there's an instruction on how to wash it which takes the pressure off of using a brush like this one. Addiction rating is positively off the charts! Looks like the retractable kabuki's promising. Must try that one out. :) Thanks Ms. Shen! This could be a great gift for my sisters. this has been my new favorite myself, like I'm leaning towards this brush more than ever LOL! Sounds like a great brush, looks very full and dense. Super cute gold packaging too and I like that is has a cover so it's keeps clean/hygienic.